CHICAGO (CBS) The Monster of Florence was a serial killer who murdered eight lover's lane couples in the Tuscan hills surrounding Florence, Italy in the 1970's and 1980's. Debate continues to this day about the real identity of the Monster. In October 1985, Dr. Francesco Narducci was found dead near a lake outside of Perugia, Italy. The doctor died of an overdose of Demerol, it appeared to be a suicide. The death was seemingly unrelated to the Monster cases. Nonetheless, in 2001, Perugia prosecutor Giulano Mignini decided that Narducci's death was part of the Monster of Florence case. Mignini claimed Narducci was a member of a satanic sect that killed women for body parts to be used in black masses, and the wealthy Perugia doctor was the keeper of those body parts. Mignini claimed Narducci was killed to keep him quiet. Even though all the Monster's victims were shot with the same gun, Mignini told a court that it wasn't the work of a single serial killer. Rather, Mignini described an elaborate conspiracy of 20 people, including government officials and law enforcement officers, who made up a secret society behind the Monster killings. Mignini indicted the 20 people and charged them with the concealment of Narducci's murder, and laid out a hard-to-follow plot that included body doubles and featured Narducci's body being swapped - not once, but twice! If all of this sounds hard to believe, it is. Tuesday, in a preliminary hearing, Perugia Judge Paolo Micheli threw out the case against the 20. The judge found there was no solid evidence to back up Mignini's claim that Narducci was murdered, let alone the victim of a satanic sect. "Mignini's malicious and completely unwarranted accusations ruined many lives and impoverished the defendants and their families," Douglas Preston, the author of "The Monster of Florence," told Crimesider. Added Mario Spezi, Preston's co-author in Italy, "The great question is: How was it possible that Mignini was able to pursue a case that everyone knew was crazy?" Those who follow the case of Amanda Knox, the American student convicted of murder in Perugia last December, will find much of this familiar. Giuliano Mignini was the prosecutor in Knox's case. 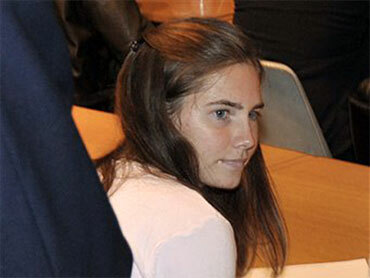 Mignini argued, at one point, that Knox was demonically motivated when, he says, she killed her roommate, Meredith Kercher in November 2007. Just like the court in the Monster case, the judge in the Kercher case threw out Mignini's demonic motive, saying there were no facts to prove it. Late Tuesday evening, when the 20 defendants were freed of all charges, they celebrated in front of the courthouse, opening bottles of champagne. Though happy about the ruling, Douglas Preston says, " I find it hard to celebrate." Preston points out that Mignini, himself, was convicted of Monster of Florence related charges in January. The Perugia prosecutor and his chief investigator were convicted of abuse of office while pursuing the case. Add to that the fact that in the past two years, Mignini has hurled satanic charges against 23 people. With Tuesday's dismissals, and his failed arguments in the Kercher case, the Perugia prosecutor is 0 for 23 on the satanic tally board. Yet he remains in office. A fact neither Preston nor Spezi can understand. "Why are people afraid to stop him?" wonders Mario Spezi. "Why was he allowed to work on the Amanda Knox case and present his crazy ideas?" Good questions, still begging answers. Doug Longhini, who reported this story, is an investigative producer for 48 Hours | Mystery. He has been covering the Amanda Knox case since November 2007.